Welcome back to the monthly vineyard updates! In the last four weeks all vines have exploded. With all the frost horror stories we’ve heard from friends we have to say we were really lucky in the end. Six nights of fire did cost quite a bit of money but decreased the overall damage to a rather low percentage. Only one Müller-Thurgau was hit really hard with pretty much all primary buds dead. Another Müller-Thurgau and parts of the Schwarzriesling were only hit partially. So now it’s all about the dormant buds which are quite a bit behind growing shoots. Hard to say at this point how many grapes these shoots will produce though. On the upside we’ve had pretty good rain until April and an at least ok amount in May (but still below average). So compared to last year’s desert it’s a pleasure to see everything grow strongly. We’ve planted about 140 vines in May to fill some of the gaps in some of the old vineyards. It was still wet when Antoine and I dug the holes making this work quite easy-going. With some compost and the following rain pretty much all of them have started growing very nicely. As the interns and I went to RAW two weeks ago we are a few days behind schedule regarding green pruning – the second most important work of the year. I just started to seriously shape the vines following the gentle pruning philosophy. 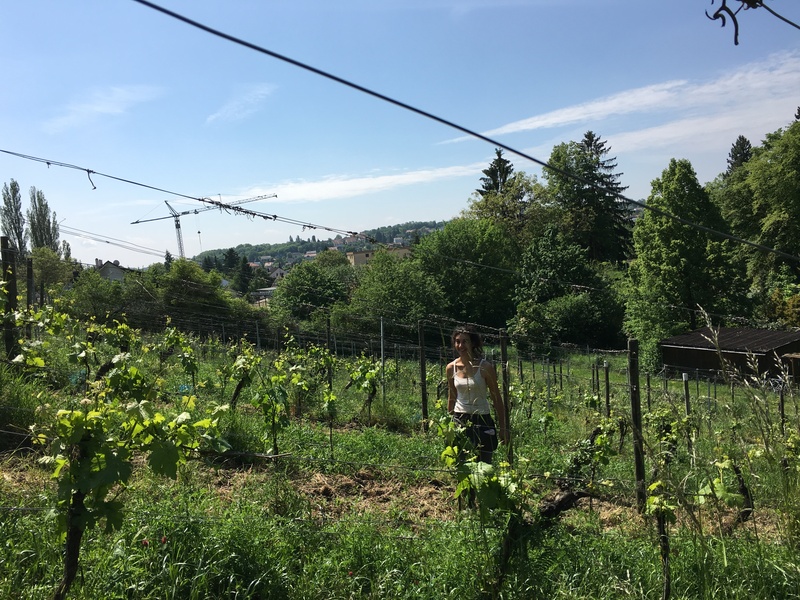 Working with a variety like Silvaner there are many options for new spurs, other varieties grow less shoots so the decisions are easier. It’s a work that takes its time in the beginning. But it’s enormously satisfying if a vine can be (green-)pruned so it has the desired two spurs with two shoots each for the next year. And as we are running a little bit behind schedule I was glad to have Nick helping out in the vineyard last week – thanks mate. The vines are expected to bloom in about two weeks, the shoots having grown from the dormant buds later of course. The weather at that time will decide how many grapes we’ll get ripening – fingers crossed! A lazy Sunday morning is perfect to clean, oil and sharpen all the tools needed again for next week. Enjoy the remaining weekend!